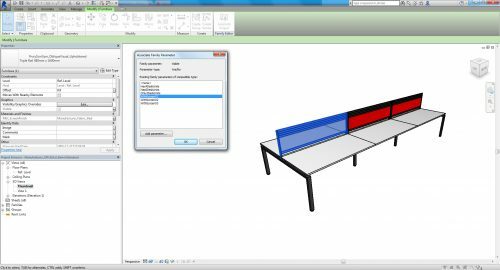 As Revit family creators, we see, use and model a wide variety of Revit Families every day, thus becoming experts in identifying a great Revit file. Are your Revit Families at the correct standard? 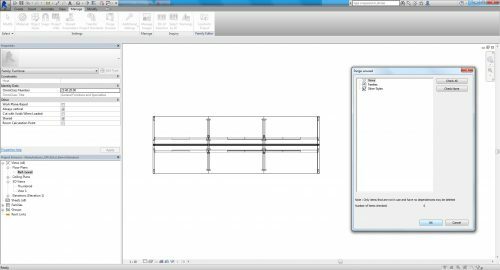 Here are our top 5 revit tips. Naming a Revit Family is not as simple as calling it ‘two-seater sofa’. If you intend to publish your files they need to follow the same structure as other available content. Within one BIM Family, multiple types can be created. For example, within a desk family, three desk types could be named ODW1208A, ODW1408A and ODW1608A or 1200mm, 1400mm and 1600mm. Selecting the right naming structure for each file is important for ease of use. If a designer is unfamiliar with a product it would be difficult and slow to choose from a list of product codes. Remember, the chances of your audience knowing the product as well as you do is rare, therefore you want to make it as easy as you can for them. All Revit Families must be natively modelled within Revit, imported DWG files are a big no go! 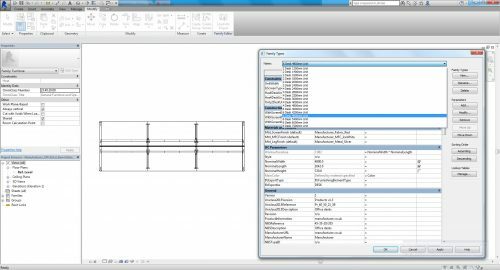 DWG’s increase the file size and prevent parametric formulas from working. Parametric dimensions should be used rather than creating, for example, 5 separate files of the same desk that slight differences in sizes. Parametric families will reduce the number of files being loaded into a project and will increase the speed of space planning and make it easier to make amendments. Either/or visibility: If the user ticks one box, the other box will turn off, and vice versa. Drop down item options: If there are more than 2 options, create a drop-down list for the user to select from. Be creative, think about how the end user is going to use the model and make their job easy! A sofa does not come in one finish, the Seat, Back and Arms can be different. 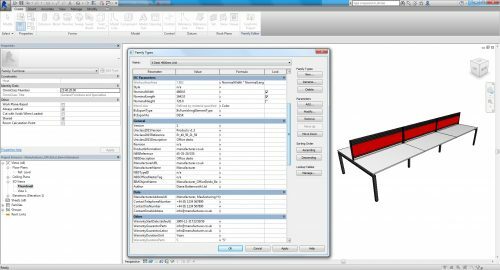 Create material parameters that are labelled and assigned to the appropriate section of the furniture. 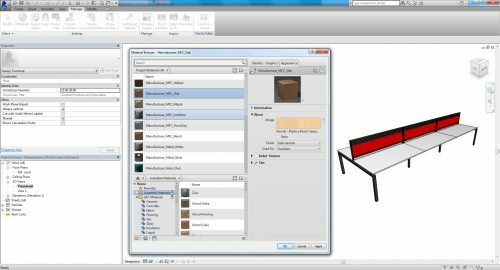 Create some example materials using Autodesk materials library, alter these to best match the actual products finish. We recommend you do not use images from your own library as the path will be lost and the product will lose its material (unless you are sending these material images alongside the Revit Family). When modelling furniture, it can be easy to begin to over complicate the shape. We do want a good visual representation, however, with each additional extrusion, sweep or revolve the file size is increasing. If you are unsure on whether your Revit Families are too big, a good guide is to keep the file size below 5MB. 4. Use the right data. No matter what object you are modelling, whether it be a chair or a light, there are certain information fields that need to be included, alongside the NBS requirements highlighted in point 1. BuildingSmart is an international platform the promotes ‘OpenBIM’. OpenBIM is a universal approach to the collaborative design, realisation and operation of buildings based on open standards and workflows and is not solely used within Revit Software. Revit Families need to be enriched with shared parametric data, a reliable resource of these can be found here. If your Family Types editor is looking sparse its likely it is missing key information. Once you have finished modelling and entering sufficient data, give your file a good clean! Purge any unnecessary items, hide any reference planes or dimensions and use a spell checker. Do your files match our list of industry expectations and requirements? Want us to check your files for you? We will create a report on the quality of your files and highlight areas that need developing, free of charge.